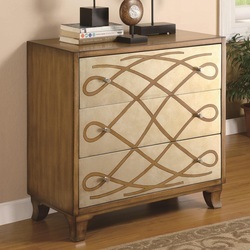 Add a touch of personality to your home with this whimsical and contemporary three drawer cabinet. Featured on the front is a eye-catching antique oak scroll design that pops forward on the cream colored base finish. The unique design bring surely bring warmth and style into your home. Three spacious drawers with modern silver handles are implemented, providing ample space for storage.